This Saturday, at Cafe du Nord! The Nellies are returning to Cafe du Nord this Saturday for a benefit for the San Francisco Bluegrass and Old-Time Festival (which starts February 12!). We’re sharing the bill with three other great Bay Area bluegrass and bluegrass-influenced bands: The Brothers Comatose, Nell Robinson (with Jim Nunally), and Bluegrass Revolution. Doors open at 9, show starts at 10, Nellies play at 10:45. For more information, check out our gigs page or the SFBOTF site. First off, Nicole would like to send her apologies to Corinne, one of our favorite fans. Corinne asked the Nellies to play “Roly Poly,” and Nicole thought it was in the first set, when it turns out it was in the second set. Corinne, you weren’t there to hear it, but we did dedicate it to you. Second, if you missed our annual Halloween show, last night, here’s what you missed. 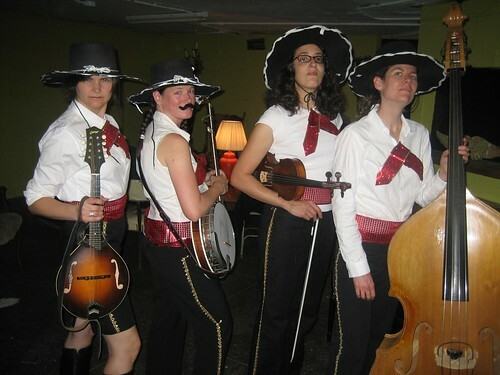 The first mariachi bluegrass band. I think it’ll catch on. 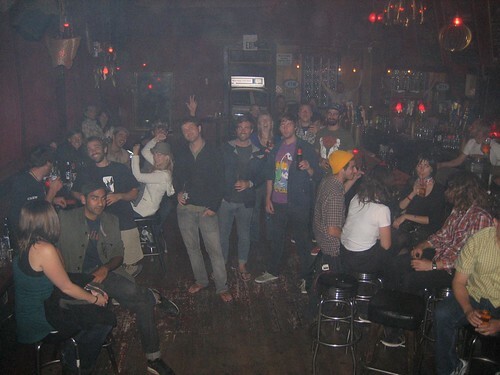 And if you’re not sure if you were there or not, check this photo, taken around midnight. Thanks to everyone for coming out and especially those of you who helped keep the fog machine going. It wouldn’t have been Halloween week without you. Y’all ready for this? This day only comes but once a year: our annual Scarefoot Nellies Halloween show! We know you ain’t too yellow to come on down to Amnesia next Monday, round about 8:30 or so, to hear some good ol’ bluegrass tunes played the way they were meant to be played: in ridiculous costumes with a fog machine churning out clouds of some mysterious substance at every available opportunity. Monday, October 26 Amnesia 827 Valencia St. 8:30 until the witching hour Free! Beer specials until 8 pm www.amnesiathebar.com Be there or be scairt. Thanks so much to everyone who came out to watch the Nellies play at Hardly Strictly yesterday. Words can not express what it was like to play at such a great venue and for such a great crowd. I wish we had taken a picture from the stage. There sure were a lot of you there! And today, the Nellies got to share our picks for the festival with the readers of Daily Candy. Check out the whole thing here. Sign up for our mailing list, using the form on the right. Man, oh man, do we have some sweet gigs for your viewing and listening pleasure next week–all over the state, too (if by “all over the state,” you mean the Bay Area and Fresno area). Saturday’s Hardly Strictly Bluegrass show! Yes, folks, it all leads up to this. The Nellies are playing on the Porch stage at 12:30 pm on Saturday, and you’re all going to come watch us and cheer us on. Molly Tuttle will be sitting in on guitar with us. It’s pretty much every band’s dream to be able to play they’re favorite festival, and this is it for us. See our gigs page for more details. You may have heard this already, but the Barefoot Nellies are joining Tim O’Brien, Hazel Dickens, Gillian Welch, Doc Watson, Jorma Kaukonen, and many others at this year’s Hardly Strictly Bluegrass Festival. Mark your calendars for October 2, 3, and 4 this year. Nellies and the Earl Brothers at Amnesia! Come on down to Amnesia on June 22 to see a fun, fun double bill with us and the Earl Brothers, our favorite old-timey-ish band. Our sunny bluegrass songs about love and prison will be a nice counterpoint to their dark bluegrass/old-timey songs about love and prison. Nellies are going on at 8:30, Earl Brothers on at 10. Check out our gigs page for more details. Barely Nellies Memorial Day Gig! We’ve got a special treat lined up for you all tonight. While Betsy and Prentice are off gallavanting around for Memorial Day, Jess and Nicole rounded up three of our favorite pickers — Tom Lucas, John Kael, and Annie Staninec — to join us for a rollicking Barely Nellies lineup. But wait, there’s more. Since we’re a girl band and all fickle-like, we invited some more of our bluegrass pals to come up and pick and sing one or two or three or so with us in the second set. It’s gonna be fun. Come on down! We just updated our gigs page, but we wanted to call attention to one very special show coming up: the fundraiser for Big City Mountaineers on July 9. This summer, the Nellies’ original guitar player, Erika Walther, is going on a four-day hike to North Palisades Peak in the Sierra Nevadas to help raise money for BCM. She put together this amazing event to help with her fundraising efforts. You can read more about it on Erika’s donation page. So far, Kathy Kallick and the Nellies are scheduled to perform, but I know Erika’s lining up some other great bands. So put it on your calendar, and if you can’t make it, consider donating to Erika’s cause.